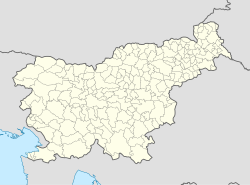 Čežarji (pronounced [ˈtʃeːʒaɾji], Italian: Cesari pronounced [tʃeˈzaːri]) is a settlement south of Dekani in the City Municipality of Koper in the Littoral region of Slovenia. The settlement includes the hamlets of Šimiči and Žnidarji. The name Čežarji is believed to be of Italian origin, derived from Cesari, the surname of a landowner that operated tenant farms in the area. Čežarji was burned twice during the Second World War. The village burned on 15 May 1941, and a large number of houses were burned by German forces on 2 October 1943. ^ a b c Savnik, Roman, ed. 1968. Krajevni leksikon Slovenije, vol. 1. Ljubljana: Državna založba Slovenije, p. 128. This article about the Municipality of Koper in Slovenia is a stub. You can help Wikipedia by expanding it. This page was last edited on 20 March 2017, at 17:23 (UTC).